EmPowerment 21 Todays Graduates! Todays Panel… Money Still Out There! Reality Check (facts about. 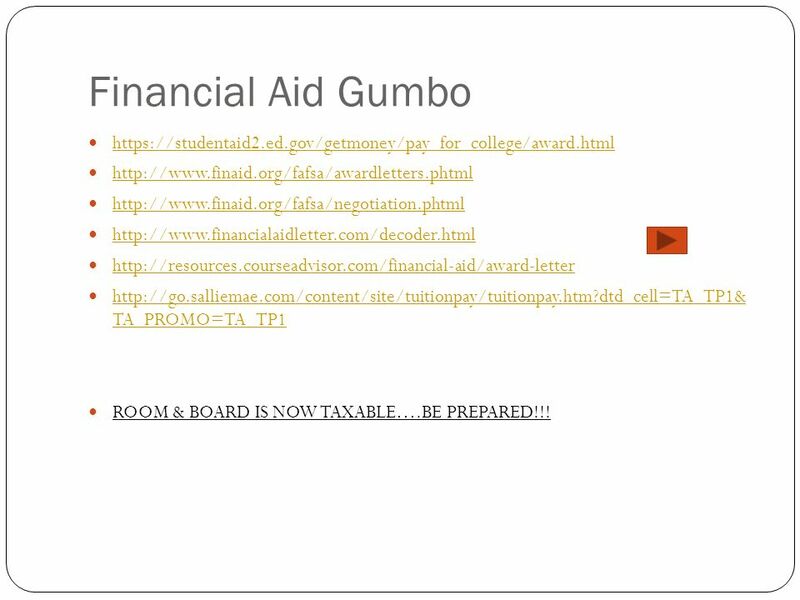 2 Financial Aid Gumbo https://studentaid2.ed.gov/getmoney/pay_for_college/award.html http://www.finaid.org/fafsa/awardletters.phtml http://www.finaid.org/fafsa/negotiation.phtml http://www.financialaidletter.com/decoder.html http://resources.courseadvisor.com/financial-aid/award-letter http://go.salliemae.com/content/site/tuitionpay/tuitionpay.htm?dtd_cell=TA_TP1& TA_PROMO=TA_TP1 http://go.salliemae.com/content/site/tuitionpay/tuitionpay.htm?dtd_cell=TA_TP1& TA_PROMO=TA_TP1 ROOM & BOARD IS NOW TAXABLE….BE PREPARED!!! 3 Questions 1. What would you do over if you could do high school over? 2. What surprised you the most about the scholarship process? 3. The biggest mistake you made in not preparing for college in H.S.? 4. The best thing while in high school that you did to prepare for college 5. What was the easiest thing about the scholarship process. 6. How much work did your parent do to help you get into college and get scholarships? 7.Did any parent help you too much?. Too little? 4 Teen Questions 8. What bad thing happen during H.S. that turned out to be good? 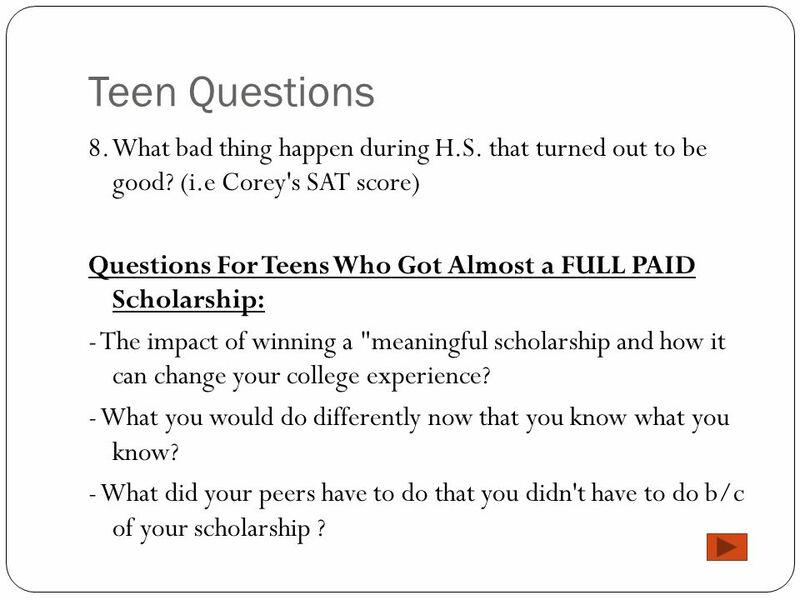 (i.e Corey's SAT score) Questions For Teens Who Got Almost a FULL PAID Scholarship: - The impact of winning a "meaningful scholarship and how it can change your college experience? - What you would do differently now that you know what you know? - What did your peers have to do that you didn't have to do b/c of your scholarship ? 5 Teen Questions Teens Who Earned Partial but NOT Full Scholarships: - What you would do differently now that you know what you know, to earn extra scholarship money or get into the college of your choice? - Did the money you earned for scholarships give you any choices that your peers didn't have? - Did you get any student loans? If so, what do you think about them and how they will impact you upon graduation? Your peers? 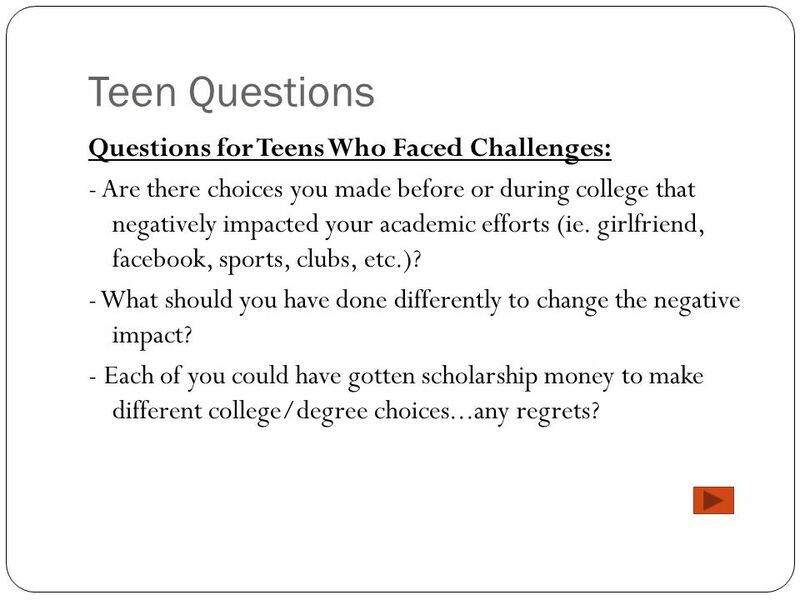 6 Teen Questions Questions for Teens Who Faced Challenges: - Are there choices you made before or during college that negatively impacted your academic efforts (ie. girlfriend, facebook, sports, clubs, etc.)? - What should you have done differently to change the negative impact? - Each of you could have gotten scholarship money to make different college/degree choices...any regrets? 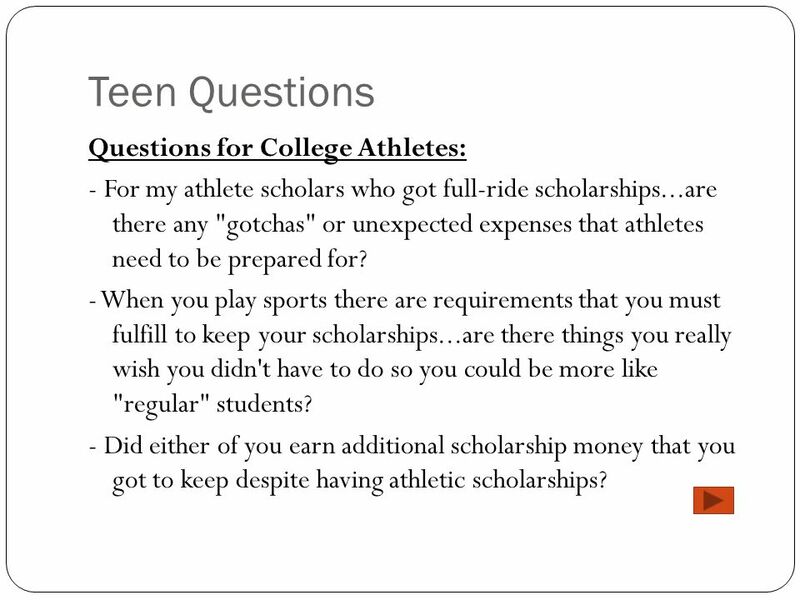 7 Teen Questions Questions for College Athletes: - For my athlete scholars who got full-ride scholarships...are there any "gotchas" or unexpected expenses that athletes need to be prepared for? - When you play sports there are requirements that you must fulfill to keep your scholarships...are there things you really wish you didn't have to do so you could be more like "regular" students? - Did either of you earn additional scholarship money that you got to keep despite having athletic scholarships? 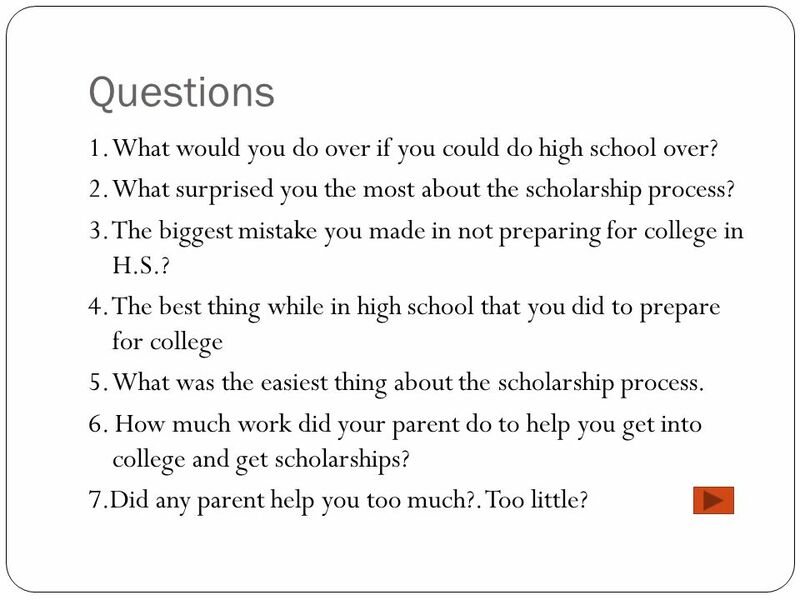 8 Teen Questions - If you had to do it all over again, would you have tried even harder to get regular scholarships to supplement or replace the athletic scholarship? 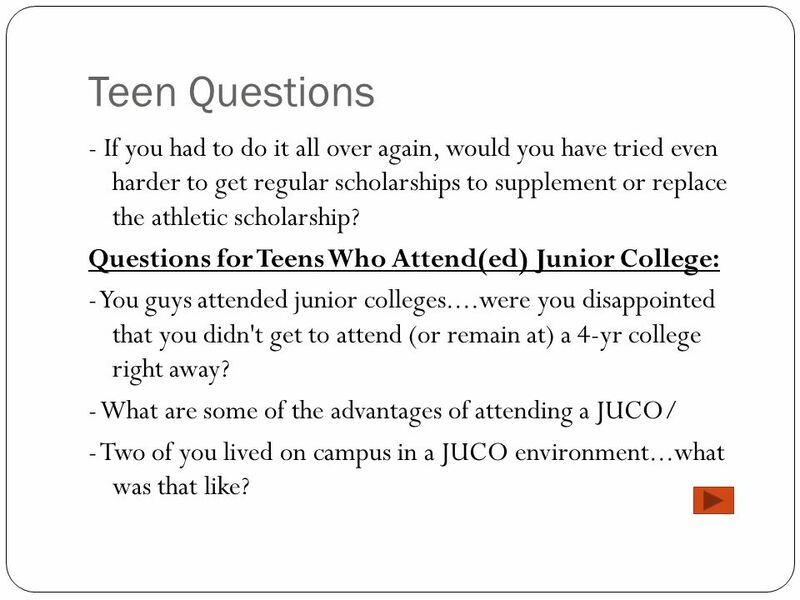 Questions for Teens Who Attend(ed) Junior College: - You guys attended junior colleges....were you disappointed that you didn't get to attend (or remain at) a 4-yr college right away? - What are some of the advantages of attending a JUCO/ - Two of you lived on campus in a JUCO environment...what was that like? 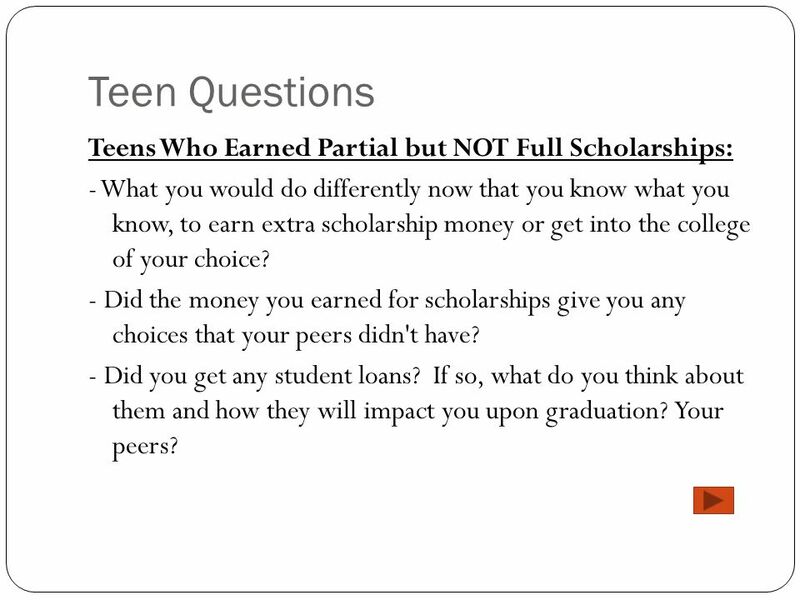 9 Teen Questions - Were there scholarship opportunities available AFTER you got to college? 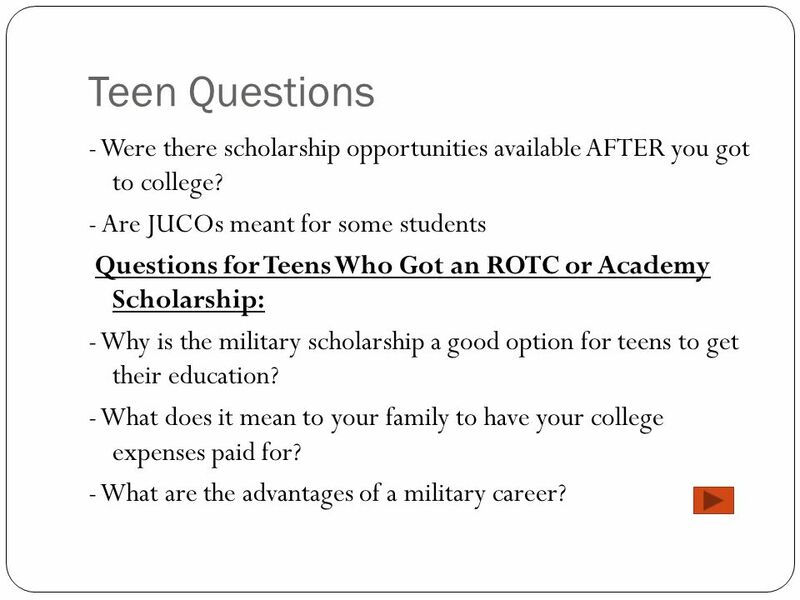 - Are JUCOs meant for some students Questions for Teens Who Got an ROTC or Academy Scholarship: - Why is the military scholarship a good option for teens to get their education? - What does it mean to your family to have your college expenses paid for? - What are the advantages of a military career? Download ppt "EmPowerment 21 Todays Graduates! Todays Panel… Money Still Out There! Reality Check (facts about." EmPowerment 21 College Professors/Administrators Mardi Gras – Choose Your Shovel Wisely! Dig in the Right Places! Even when you get to college…dig!!! We Need Money!!!! Financial Aid 101 Information Session Class of 2014 GSMST. 1.  What options do we have?  Where do we start?  How do we apply for aid?  Will my information be safe?  What funds could we get?  Is it worth. Financial Aid Basics. Financial Aid Makes College Dreams a Reality. College Financial Aid “Putting the Puzzle Together” Presented by: Dorothy Gilliard HESAA and FASNA LLC. Guiding the Way to Higher Education Families, Counselors and Communities Together. Precollege Programs College Edition 2 pt 3 pt 4 pt 5 pt 1 pt 2 pt 3 pt 4 pt 5 pt 1 pt 2 pt 3 pt 4 pt 5 pt 1 pt 2 pt 3 pt 4 pt 5 pt 1 pt 2 pt 3 pt 4 pt. Education. Go Get It. College for Texans Campaign.